I am a housewife with three kids, already a very heavy-duty job but still like many others; I have a dream to pursue a career of my own and make a mark professionally. With this great believe that Almighty Allah has blessed women in particular; a special ability to simultaneously excel and take care of all, whether at home or any field; I decided to finally step into the professional world. Now the first question that arose, what should I do? It was almost a decade gap with no work experience at all after I completed my MBA. To be honest I was much afraid; which option to choose from? Who to trust? and above all how to gain back the self-confidence. I had my constraints too, a home to manage and kids to look after, which is my prime responsibility as well. The answer to all these questions came to me in the form of MarCom. A firm who showed faith in my abilities and gave me back that lost confidence; not only through provision of a platform to showcase my creative skills and polish them, but also by giving me enough freedom to work within my limitations. Having studied business, I am well aware of the kind of influence advertising has on our everyday lifestyle. It converts our wants into needs, dreams into desires. 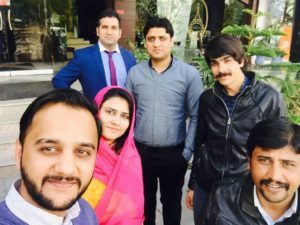 As a socially responsible Pakistani, I would like people with such influential power on our decision making, to not only be just more skilled and proficient, but also most importantly socially responsible, so that they don’t take advantage of their respective positions to exploit others. Money making should not be their sole objective. I consider myself very lucky that I was able to find a place at the right agency (MarCom) that actually practices strong moral values. Hence our philosophy matched fully, and I started working on equal frequency and moral grounds. For me Life at MarCom is simple, exciting and full of passion. Over all, the work culture is highly motivational, which enables us to bring out our best. MarCom strongly encourages all team members to share any creative idea that pops up in our mind irrespective of the job title or department. This enabling environment helps employees to think out of the box. Roles are important for work distribution/ assigning of responsibility; but at MarCom there is no defined boundary to limit creativity or passion to contribute in any project. I truly believe that free flow of ideas is one of the major reasons behind success of MarCom in such a short span of time. The best thing I found at MarCom is the rare culture of appreciation/recognition; where people and their work is cherished and celebrated more than anything else. I was pleasantly surprised to find an agency celebrating the smallest of occasions to the bigger ones. Life becomes so easy, satisfying, more meaningful and enjoyable when work is more like fun and colleagues become more as family members. This for me is the concept of an ideal workplace which I am lucky to be part of and enjoying every bit since I joined. While sharing how Life is at MarCom, I feel it is pertinent to mention the inspiring journey of two young brains behind this rapidly growing one stop communication firm. I feel honored to be led by young, focused and specialized thorough professionals, passionate enough to show the world their strength, expertise, intelligence and sheer talent. Both our founders are powerhouse of knowledge and experience, a lethal combination to be successful in any field. 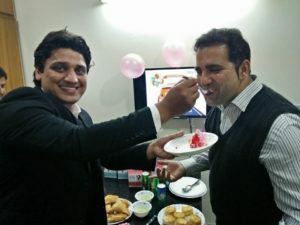 It is so encouraging to know that both have actually been at our place at first, serving the industry with same passion for years as an employee. Their persistent hard & smart work, pure loyalty towards the profession has always been talk of the town even before starting up this firm. 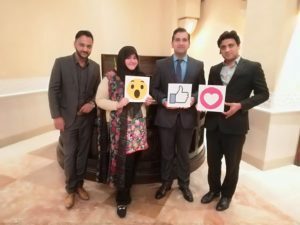 Despite financial limitations, minimal resources and negligible investment, they took a major risk with purity of purpose solely to realize a dream of creating a top-quality internationally recognized Pakistani ad agency which is not only a hub of creativity but also a place of pure happiness and actual empowerment for everyone involved. This they feel have been missing from the industry over the years. 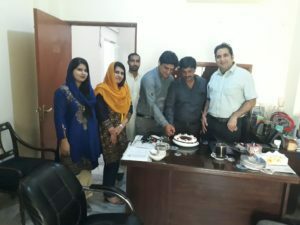 The success and growth of MarCom over the last two years is definitely the result of the untiring day and night efforts by the founders who have always remained at forefront at every platform, every stage of work to ensure best results possible. At MarCom, Pakistan always comes first; another similarity which I dearly hold. It is astonishing to witness the kind of love and passion team MarCom has when it comes to anything about Pakistan. This ownership is unfortunately lacking these days. I proudly claim to be a part of an ad agency which keeps coming up with ideas and ventures that can help promote Pakistan and Pakistanis across the globe. 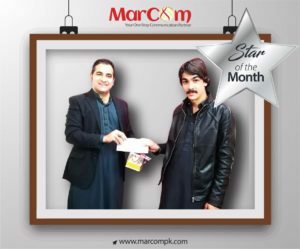 With initiatives like Promising Pakistan, Inspire Pakistan, Pakistani Tohfa and so on; MarCom is making its humble contribution to keep the Pakistani flag high and roaring. To sum up, I must conclude by saying MarCom is indeed a much-needed addition to our rapidly growing and competitive advertising industry. It is not only gaining recognition amongst a diversified clientele but for me it has proved to be an ideal employer. Kudos to the owners as they are leading from the front and setting example for the others to follow. Wishing MarCom a very happy 2nd Anniversary and prayers for unlimited accomplishments and victories ahead. Previous post Pakistan – A Food Heaven! Next post The Pakistan Army… it’s friends and foe!